This was a very full day of cruising, much more than in recent times, as I opted to take Lady Martina inland from Stavoren through several of the Friesian Meers until we could stop on an isolated meer at Paardenhoek for a lovely lunch-time picnic with Max who was very relaxed and behaving himself even though a number of walkers and cyclists came by. With thunder clouds threatening, we pressed on back onto the De Morra, along and across the De Flussan mere until we approached Heeg. I look around for somewhere suitable to moor but the place was quite busy and so we turned back, cruising along the Koarte and Lange Fliets until we could pass under the three lifting bridges and approach Workum. 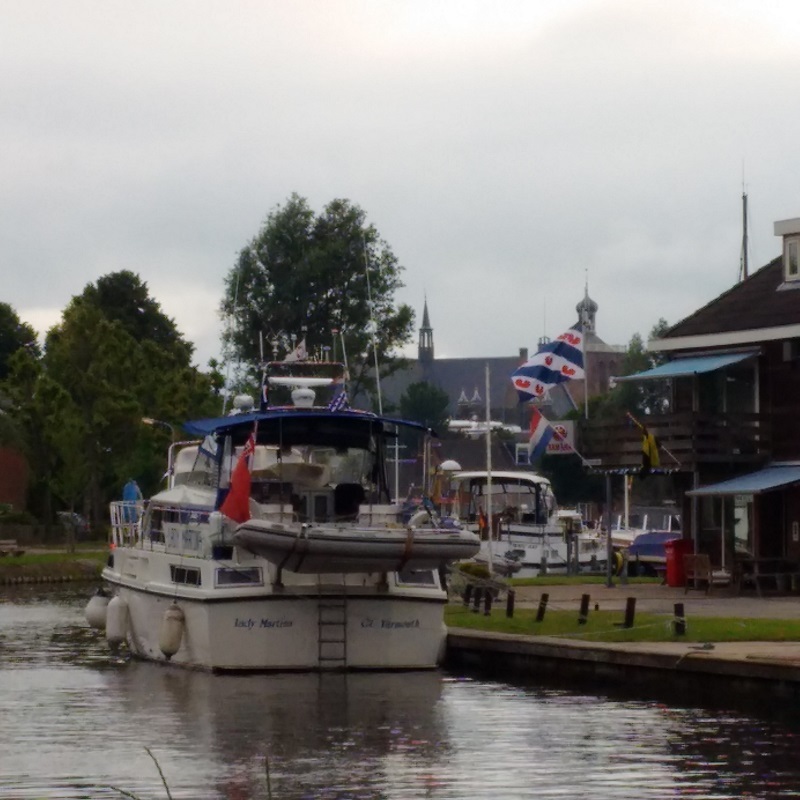 I was then able to find a space at the same place I moored in 2004, which was then known as Kuperus Watersport and is now just known as Workun Watersport but still had un-metered electricity for us to connect to. 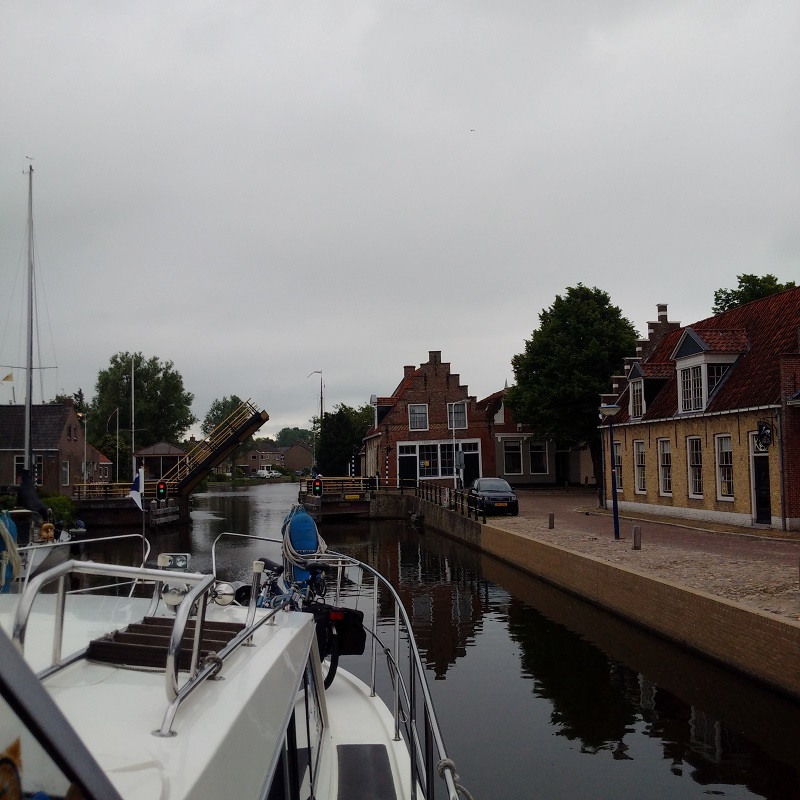 Earlier on, we left Stavoren, turning inland and along the Johan Friso Kanaal. The first bridge lifted without delay of need to call them on VHF 85 and then we cruised along with another motor boat in a general north-easterly direction across the De Morra mere. I had wrongly interpreted the charts and thought we had gone much further than we had when we came to Galamadammen and so it was understandable that it did not look like Heeg! I turned back and went north west up what I thought was the Yntemasleat but it was actually the other end of the canal that led back to Hindeloopen and was restricted to 3m headroom! In the event, we just went a little way along, found an excellent informal grassy mooring and could let Max roam whilst we sat on chairs outside and enjoyed a picnic. Another boat joined us eventually and I sought their advice but they spoke no English and so they could not warn me that I had turned off of the meres too soon! In the end, I realised and we embarked upon the rest of the journey across the De Morra and then through the De Fluezen mere, passing our turning at first as I wanted to check out Heeg. 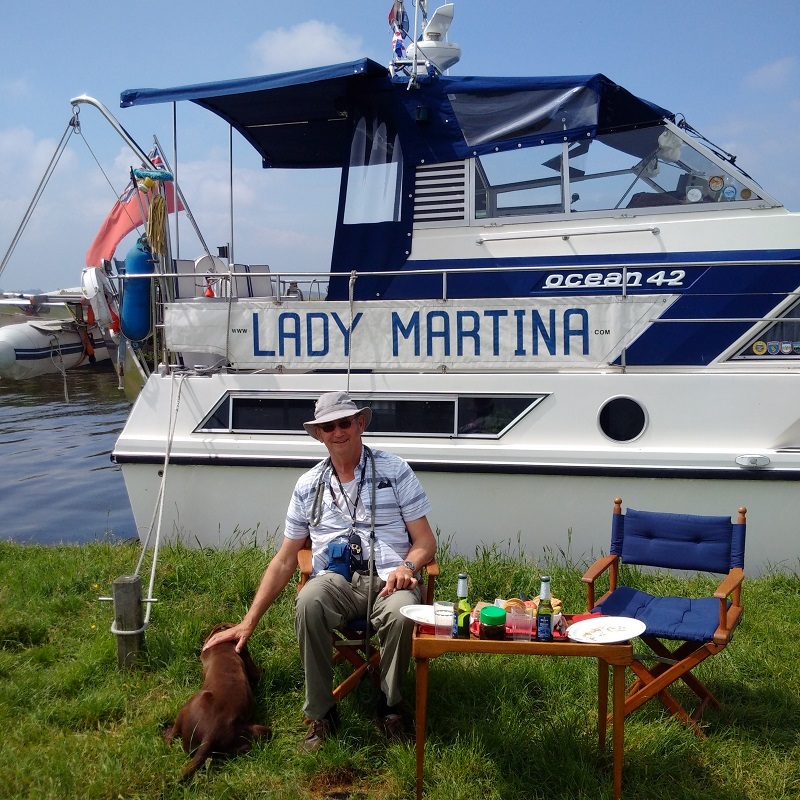 It looked like a nice place but it was mid afternoon by then and all of the better moorings were taken and I did not want a marina box or to raft up to another vessel with my dog Max on board and so I turned back and we followed out original course towards Workum. It was about then that I noticed that there was a track on my MaxSea chart plotter from 2004, when I had cruised through the Freisian Mere from top to bottom. I followed this course along the canal through more meres and then under three lifting bridges to find that mooring.